Ascending Butterfly is proud to join forces with Mimobot, makers of Designer USB Flash Drives for our first annual 'Fourth of July' giveaway'! Fourth of July is a time of year where many memories are created, family cookouts/barbecues, picnics, fireworks. Tons of wonderful photo opps can sometimes overload our cameras and our hard drives. It is important to have a safe place outside of your computer to back up files and let's face it we've all seen the commercial where someone has to delete a photo to create space for an impromptu photo they want to take. Nothing is better than peace of mind, and having a Flash Drive is just that. Peace of Mind. I am a confirmed computer geek and love all things related to the computer, even the peripherals that hang out of it, everything that plugs into it, well you get it.... To totally affirm my quirky but cute geekiness, I have finally found a product that combines my love for all things computer, provides me peace of mind (receiving it reminded me to immediately back up my photo files! ), and is just plain awesome! I received the 4 GB Star Wars Mimobot Series 3 Designer USB Flash drive. That is enough flashy goodness to back up approximately 3500 photos! Since 2005, Boston-based design house Mimoco has fused the art of contemporary characters with the functionality of personal data storage devices making its name known in both the pop-culture driven Art Toy underground and the savvy high-tech 'tronic world. With a mission to bring style and soul to consumer electronics, Mimoco is renowned for their flagship collection of MIMOBOT® designer USB flash drives. The distinctive character-based MIMOBOT line offers from 1GB to 8GB of flash memory storage and transport for all your finest and most precious music, docs, pics and other personal data bits and bytes. Now for the good stuff! 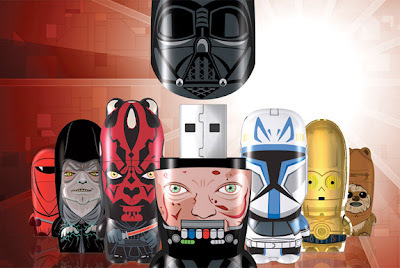 The winner will receive a 2 GB Star Wars Mimobot Series 3 Designer USB Flash drive! Because even Ascending Butterflies take off on National Holidays, The winner will be selected and notified on Monday, July 6, 2009. And because I know often times people take long weekends, the winner will have until Wednesday, July 8, 2009 to respond. If the winner does not respond, another winner will be selected. Winning entry must follow entry rules or another winner will be selected so please read carefully! Winners name once confirmed, will be posted on this site. Visit Mimobot and browse their selection of designer USB flash drives. Comment here with your favorite (please choose one other than Vader) AND follow this blog. • 1 Extra Entry if you blog about this giveaway with a link back here. You can list each thing you've done separately for a separate entry. I will confirm your extra credit twitter entries directly via *tweet* on twitter! Vader is the best one. I love all the Star wars ones. I like C-3PO and Golden Panda the best, they're all so neat. Very cute and fun. Also,I'm now a follower. Thanks for the contest. I love the Zombie Tiki God by heyimlindsayp and I'm following your blog. My favorite is the Domo X Mimobot! So cute! I've wanted one of these for awhile. & I'm following the blog! I really love Swirl, but I also really love Pirate Nero. I just got him today! I just tweeted about the contest, and I am already following @mimobot. Yakuza by eetteekers is cute. I like Japanese art. I love the C-3PO mimibot. Gold who can resist. Gotta go with Darth Vader on this one. I love Princess Leia best! I'm following Mimobot on Twitter! Darth Vader is my favorite. Thanks! Darth Mual is my favorite by a land slide!!! I like Darth Vader myself. So cute! I also like the Fairybit Mimobot. Thanks! I like the Darth Vader and I follow our blog! My brother would be tickled! Star wars FANATIC! Thanks for the chance. I like the Golden Panda by ShanDurRah. - I followed Mimobot's Twitter. - I followed you & Mimobot's Twitter. I love Queen by Undoboy, cute! Good luck on everyone. Fave mimobot other than Darth Vader is Captain Rex. I voted on Friends With Elsie. I love the Pink Meletta by tokidoki. My favorite is Venison by Gary Baseman. I like Meletta by tokidoki. I like pirate nero by tokidoki. I like the Zombie Tiki God the best. Thank you. I really like Pastaio by tokidoki--so cute! I love the Royal Guard - it looks just like in the movies! The Darth maul one is really cool. Gotta go with the Royal Guard. I love the Darth Maul!! I love the Darth Maul! I love the C-3PO! I have a friend who would LOVE this, thanks! I love Halo Red Spartan! My son would love the darth vadar, but I like Leia. Thanks for the giveaway. I also like the C-3PO and Owsley Owlbert. Please accept my entry. Thank you. of the non-star wars, I dig the Zombie Tiki God and the Rasta Domo. of the Star Wars, Wicket the ewok is the best, Royal Guard a close second. Tweet. Happy 4th of July! I love the C-3PO one! My favorite is "Zombie Tiki God by heyimlindsayp"
And I'm following your blog. I don't know if my previous post went thru...delete if this is a dupe. I like Giggles by Happy Tree Friends. There are so many cute ones I had a hard time choosing. I like the Darth Vader unmasked. I love the Zombie Tiki, it's the best of both worlds! and I subscribed. i love minobots (i own a few)- they work great & look great too! right now i'm loving the super malfi, cute! I think the Meletta by tokidoki is so cute! I'm following your blog too. The OWSLEY OWLBERT is awesome! Thanks for the giveaway! I like the C-3PO Mimobot! These are so friggin' cool! Aw the C-3PO is so cute and also the pupStar! I love Happy Tree Friends, so all those are good, but I think my favorite is the Zombie Tiki God. Following. Wicket the Ewok is my fave!! He's so cute!! OMG, I just love them all!! Thank you so for blogging about these.